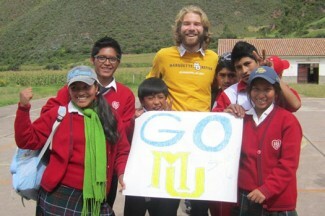 Brian with some of his students at Fe y Alegría 44 in Andahuaylillas, Perú. 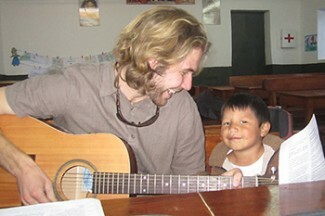 A few years ago, I moved to Peru to work as a teacher with the Jesuit Volunteer Corps (JVC). Each year, the school where I taught picked a tema trasversal, or transversal theme, toward which the entire academic community would strive. I like the idea of naming a broad idea that encapsulates a particular season of life. When I consider my own tema trasversal for the year and a half I spent in Peru, I consistently arrive at “presence.” It arose almost every day during my time with JVC, rearing its head in everything from the books I read to the retreats I attended and the community activities in which I participated. Why presence was so important is probably not mysterious. Service programs take all kinds, but volunteers frequently share an ambition to not only be someone great but to do something great. Whether starting an after-school sports program or building a library, volunteers can be prone to a “save-the-world” mentality which, however idealistic, is generally naïve and sometimes even patronizing. I did not have a cell phone or Internet access in my house. When I was waiting for a meeting to begin or enduring a conversation I found boring, there was little to divert my attention… Little by little I found myself becoming more attentive to the people, places and events around me. JVC labored to remind us that our goal was one of accompaniment, a walking with, and not before, others. In other words, what mattered most was being with people, not doing something for them. Coming from a North American society that tends to value constant motion and checking items off a to-do list, it was a shock to the system to spend so much time sitting around, doing little more than chatting with people or passing a bottle of beer around a circle. It occasionally made me anxious, leading me to lament to the Peruvian Jesuit priest who oversaw part of my work that I did not feel I was doing enough for his community. Over time and with his guidance, I came to see that much of what was expected of me involved forming and nurturing relationships with my students, colleagues and neighbors. I wanted the fireworks of a grandiose project well done; but ensuring a classroom of 35 preteens did not devolve into chaos, being available to my students and friends, and staying involved in their lives and letting them into mine pretty much summed up the job description. The old adage about the significance of showing up held sway. Brian and a little boy at a parish choir practice. This is not the first time I have written about presence or touched upon the importance of simply being. It is becoming an increasingly familiar topic in our culture, usually discussed in the context of mindfulness and the myriad of ways we distract ourselves with smartphones and other electronic devices. ABC News anchor Dan Harris extolled the virtues of meditation in his book 10 Percent Happier. 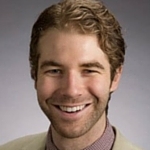 NPR recently published a story about a University of Virginia study that found some people would rather give themselves an electric shock than sit in an empty room and do nothing but think. TIME magazine’s February cover story “The Mindful Revolution” proclaimed the health benefits of actively trying to live in the moment. It is an issue that arises again and again, because it is a lesson of which we need near-constant reminding. I see myself as having been remarkably fortunate in Peru; I did not have a cell phone or Internet access in my house. When I was waiting for a meeting to begin or enduring a conversation I found boring, there was little to divert my attention. Yes, my mind could still wander, and it often did, but little by little I found myself becoming more attentive to the people, places and events around me. This was a presence enforced by circumstance. In the United States, it is a matter of choice. We must choose to set aside our phones when speaking with someone face-to-face, commit to doing one thing at a time, or take whatever other measures help us to be more aware of the world around us. Jesuit Volunteers work with communities to directly serve the poor and marginalized in the United States and developing countries. For a year or more, Jesuit Volunteers live simply, in community, immersed in Ignatian Spirituality. Learn more about becoming a volunteer on the JVC website. This is a worthy endeavor for countless reasons. As I said, it can serve our health, make us more engaged and engaging in conversation, and allow us to finish a task without checking our e-mails 30 times. The main reason I am grateful for the presence I learned to seek in Peru is that it allowed me, as Elliot said, to really be there and, as de Mello said, to experience it in all its loveliness and beauty.